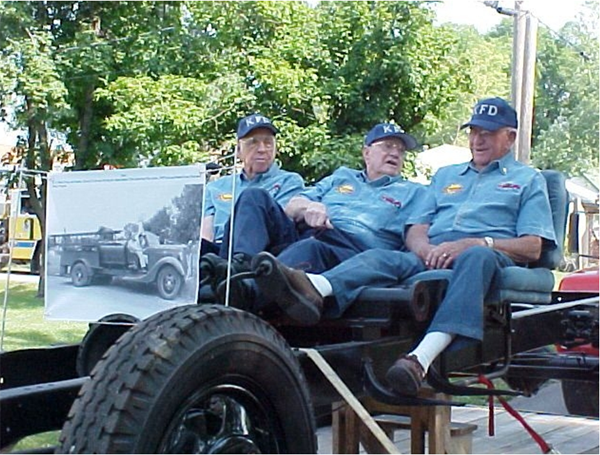 The Kearney Fire & Rescue Protection District is sorry to announce the passing of their last life time member, Darrell L. Cave, who is seated at the right with lifetime members Mike Thompson and Jim Hall during the 2006 City’s sesquicentennial parade, on the frame of the City’s original fire truck. The 1935 Ford was purchased in January of 1949 from Overland Park and Darrell was the one that actually drove it home. The flag at the station will fly at half mast on Wednesday, April 23rd in honor of Darrell.